The ProximityOne "Census Tract/Block Street Index" (CTBSI) provides an easy-to-use means to associate addresses with a Census 2010 census tract or census block -- and other geography. Use those codes to meet reporting requirements and determine demographic-economic attributes for addresses of interest. This section reviews use of the CTBSI files developed in part using the Census 2010 and post Census 2010 TIGER/Line files and related data. 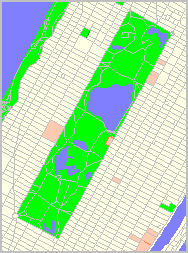 By assigning the census block (in which the address is located) code to an address, many other types of geography can be determined. These geographies include state, county, city/place, legislative and congressional districts, school districts, ZIP code areas, block groups among other political/statistical areas. 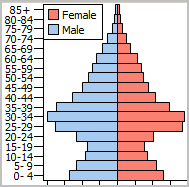 By having the census block/tract code, demographic attributes can also be accurately assigned to each address.  View/use CTBSI data in the interactive table below.  View/use CTBSI data in downloadable Excel file via links below. ProximityOne corrects and extends data in the Census TIGER/Line files. The TIGER/Line file have missing or incorrect values for road names, address ranges, ZIP codes and other key attributes. We continuously develop and update those data from local sourced data. No adjustment is made to the assignment of geographic codes. 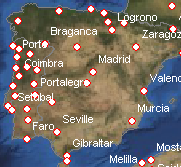 The CTBSI is a part of the ProximityOne Digital Map Database (DMD). The CTBSI provides an important alternative to geocoding. Geocoding is the process of determining/assigning the latitude-longitude of an address and geocodes (e.g., census block) for the location. CTBSI provides a county-by-county text file/lists where each row corresponds to a street segment and includes the street name, low and high address range, city, county, state and census tract/block codes. The CTBSI contains no demographic data itself but provides a means of linking to those data. Often the census tract code is required to meet government compliance regulations. Also, by having the geocode, demographic attributes can be accurately assigned to each address to facilitate marketing, planning/evaluation, risk assessment and a range of other business uses. The main advantages of using the Census CTSI included simplicity, little or no software, and cost -- it was free. CTBSI is available for use on your computer. Alternatively, we process address files as a service and return the original address data appended with geocodes and optionally subject matter data. Contact us for additional information; mention CTBSI in text section; or call (888) 364-7656. 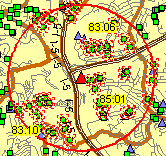 Geographic Information System (GIS) software is not required to use the CTBSI data/file. However, the CTBSI data are derived from GIS applications, are compatible with GIS applications and CTBSI value can be enhanced through use of GIS software. The graphic below shows a map of the location of the first street segment shown in the interactive table further down in this section. 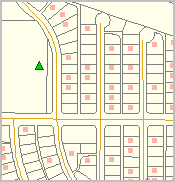 The pointer is located at that street segment. As shown in the table, the left side of that segment has potential address range from 6301 to 6399. Click graphic for a larger view. Expand browser window for best quality view. The larger view also shows a mini-profile for that segment. See that the ID shown in the mini-profile, and address ranges, are that same as in the interactive table. 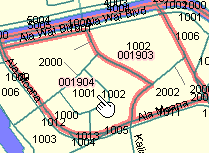 The next view shows a zoom-in view to that street segment (see pointer). 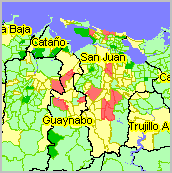 Census blocks are shown with red boundaries and geocode (GeoID) as yellow labels. Compare the GeoIDs shown on the left and right side of the segment are the same as shown in the table below. 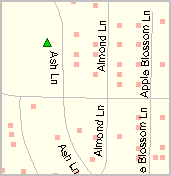 The next view shows a zoom-out view to that street segment (see pointer). Census tracts are shown with blue boundaries and geocode (state-county-tract) as yellow labels. Compare the GeoIDs shown on the left and right side of the segment are the same as shown in the table below (the segment is not on a tract boundary). An illustrative CTBSI interactive table is shown below for street segments located in Fairfax County, VA. The CTBSI database covers the U.S. wall-to-wall and is available for single counties, county groups or the U.S. 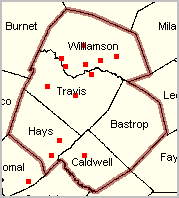 There is a row for each named road segment in the county. Not all items in the CTBSI base file are shown. The table has been developed through use of several Census 2010 TIGER/Line shapefiles and related files. The table is intended to illustrate the process of associating a tract/block with an address. The actual CTBSI data/files are distributed in comma-delimited structure and contain many more fields than shown in the interactive table. See the extended field list below in this section. Improving Census/TIGER. 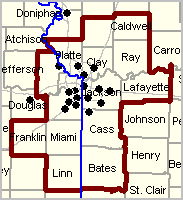 The original Census TIGER/Line edges shapefile used to develop the data shown in the interactive table included approximately 101,000 "edge" segments for this county. Of these. approximately 65,000 were coded as road segments (others being railroads, streams, etc.). We know that some number of the difference are actually roads but incorrectly coded. Of the approximate 65,000 coded as roads, approximately 11,000 are missing a road name. Of the remaining approximate 54,000 road segments with names, a large number have missing low or high address values. Sometimes all address fields are not available. 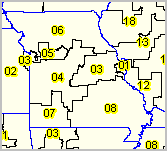 See details on county-by-county segment counts and completeness by type attribute. 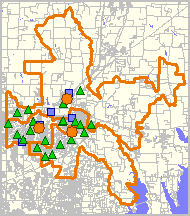 Uses illustrative road/street data for Fairfax County, VA; selected CTSI fields. Click ShowAll button between queries/lookups.  Click ShowAll button to show all areas and restore table. and click Find in Name button to locate all qualifying segments.  The Find operation performs a query on the FullName column. Click on these links to open the county CTBSI file in Excel format. - Files contain the basic, non-extended, data (address ranges have not been updated). - File columns are named/described above and structured as shown in the interactive table above. - Files are sorted on SegName+AddrFL.